The Diplomat speaks with journalist and strategic thinker Robert Kaplan about his upcoming book and more. 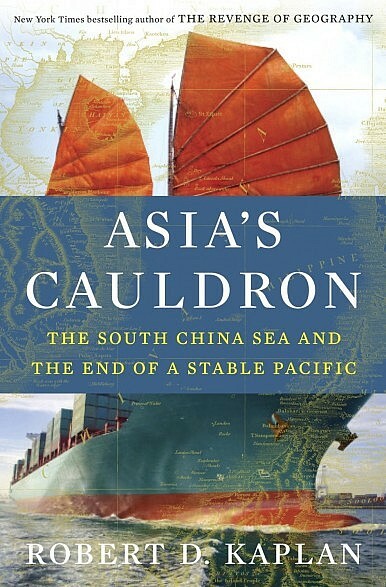 The Diplomat‘s Justin McDonnell spoke with Robert D. Kaplan, American journalist, Chief Geopolitical Analyst for Stratfor, and correspondent for The Atlantic regarding his upcoming book Asia’s Cauldron: The South China Sea and the End of a Stable Pacific, the influence of geography on international politics, and more. What sparked your original interest in Asia, and how did that interest evolve into a book about the region’s maritime geography and strategy? I was at first fascinated with the Indian Ocean as a concept that Americans ignored at their peril, given that America is an Atlantic/Pacific country. After completing my book about the Indian Ocean, Monsoon, a few years ago, I decided that at some point I should do a sequel, or coda, on the South China Sea, which is after all an antechamber of the Indian Ocean. People ask me why I didn’t write about the East China Sea, well, I wasn’t chasing news. Rather, I was committed to completing my work on the Greater Indian Ocean, to which the South China Sea is a part. When you focus on any body of water, geography is paramount, and from geography strategy and geopolitics naturally emerge. How does geography influence foreign policy, and what challenges will it present to the international system? Geography establishes constraints within which foreign policy must operate. These constraints are often basic, elementary, obvious, and not very engaging, but no less true as a result. Russia is a land power with only one warm water egress: thus any Russian leader must be sure about his access to Crimea. Great Britain is a sea power which required throughout much of history an advantageous balance of power regime on the nearby continent. Taiwan must fortify its beachheads against any theoretical Chinese invasion plans. Geography shows us things a leader must do, and what he cannot do. Beijing is stepping up its territorial claims to a significant portion of the South China Sea. Taiwan, Vietnam, Malaysia, Brunei and the Philippines all have competing territorial and jurisdictional claims and the risk of conflict and use of force is significant. What is the most likely and dangerous contingency and how might these disputes be resolved? The most likely and dangerous contingency is that there will be an incident in the air or at sea that will lead to an eruption of military violence. And however brief that violence may be, it will raise diplomatic tensions at a sustained level forevermore; thus the region becomes an anxious and complicated armed camp — even more so than today. These disputes are are often so complex that they have no practical solution. The best that can be hoped for is a stable balance of power regime between the American and Chinese militaries that keeps a tenuous peace. As the U.S. continues to deepen its engagement in Asia, it faces a difficult balancing act. Where the U.S. has interests in maintaining open sea lines of communication, China looks to be trying to shift the status quo in its favor. How does the U.S. respond in a way that avoids risk of confrontation yet without conceding? The U.S. needs to prevent China from Finlandizing countries such as Vietnam, Malaysia, and the Philippines, yet at the same time it needs to avoid getting dragged into a war with China. This means the U. S. must maintain a robust military presence in Asian waters, while at the same time never ceasing to diplomatically engage with China. Where might the confrontation between China and Japan lead? The great danger of a China-Japan confrontation is that it will drag the United States into a conflict with China in order to help defend Japan. The U.S. and Japan are treaty allies. But behind the scenes the U.S. is uneasy about rising Japanese nationalism. Is comparison of modern China to an emerging Germany of 1914 an accurate parallel? The comparison between the China of today and the Germany of 1914 is overblown. I prefer the comparison of China’s goals in the South and East China seas with the goals of the United States in the Greater Caribbean in the 19th and early 20th centuries. The U. S. had seen the Caribbean as a blue water extension of its continental land mass which it sought to control: the same with China now in its adjacent seas. I hope readers will gain an appreciation of the beauty and complexity of such countries as Malaysia and Vietnam. I hope they will see the book as a combination of journalism, travel writing, and strategic analysis. I tried to write the individual country chapters like classic, long-form, deeply reported magazine pieces. I hope I have at least partially succeeded. The Diplomat's Carl Thayer reports on Vietnam's Da Nang conference on the status of the Paracel Islands.